Pt usually present with sudden onset unilateral ptosis. Rarely, bilateral if the damage occurs to the third nerve nucleus, frequently accompanied by peri orbital pain or headache. Pt may or may not complains of double vision because the ptosis obscures the vision in the affected eye. If eye lid is manually elevated, the patient will definitely experience diplopia. On examination limited elevation, depression and adduction. There is an underaction of the superior, inferior, and medial recti muscles and inferior oblique muscle, which may be total or partial. The pupil may be dilated and minimally reactive to light (pupillary involvement), totally reactive and normal (pupillary non-involvement), or may be sluggishly responsive (partial pupillary involvement). Third (Oculomotor) CN palsy results from damage to the nerve anywhere in its course from the third nerve nucleus in the dorsal mesencephalon, its fascicles in the brainstem parenchyma, the nerve root in subarachnoid space, or in the cavernous sinus or posterior orbit. 1. Damage to the third nerve nucleus results in an ipsilateral third nerve palsy with contralateral superior rectus under action and bilateral ptosis. 2. Damage to the third nerve fascicles results in an ipsilateral third nerve palsy with contralateral hemiparesis (Weber's syndrome), contralateral intention tremor (Benedikt's syndrome), or ipsilateral cerebellar ataxia (Nothnagel's syndrome). Vascular infarct, metastatic disease and demyelinization are the common causes of brainstem involvement. 3. Damage to the third nerve within the subarachnoid space produces an isolated third nerve palsy. The main causes are compression of the nerve by an aneurysm of the posterior communicating artery or the basilar artery, and ischemic vasculopathy. 4. 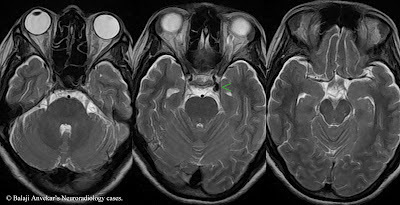 Damage to the third nerve in the cavernous sinus, superior orbital fissure, or posterior orbit is unlikely to present as isolated third nerve palsy due to the confluence of other structures in these areas. Cavernous sinus involvement may also include pareses of cranial nerves IV, VI and V-1, and an ipsilateral Horner's syndrome. The common causes of damage in these areas include infective, non infective inflammatory, neoplastic and carotid artery aneurysm. • Isolated third nerve palsy due to ischemic vasculopathy will spontaneously resolve and recover over a period of three to six months. If the palsy fails to resolve in this time frame, repeat the MRI to search for the true etiology. • Myasthenia gravis has the ability to mimic virtually any cranial neuropathy, including isolated third nerve palsies. 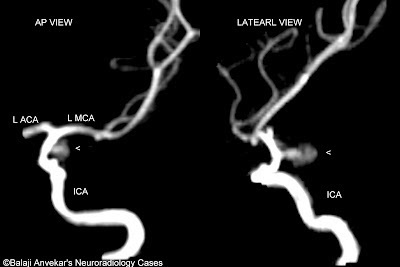 Third cranial nerve palsy caused by internal carotid - Posterior communicating Aneurysm is one of the most challenging problems facing the ophthalmologist. This Pcom aneurysm is responsible for 13 - 30% of acquired oculomotor palsy. Usually present with three clinical signs, includes 1. Ipsilateral facial, orbital or ocular pain, 2. Extraocular muscle and levator involvement and 3. Pupillary paresis. Isolated third nerve palsy may be the only presenting sign of this aneurysm. A patient with isolated third nerve palsy with pupillary involvement should be considered as aneurismal third nerve palsy until proven otherwise. Urgent neuro imaging and intervention necessary because of the possibility of aneurysmal rupture and intracranial hemorrhage carries a significant risk for morbidity and mortality. Treatment options includes craniotomy and aneurysmal clipping. Recent reports indicated that endovascular management also produce effective neural recovery. Hand book of occular disease management. Special Thanks to Dr Pandurang Wattamwar MD DM Neurology.